Caracas, Feb 13 (IANS) National Assembly Speaker Juan Guaido, who proclaimed himself Venezuela's interim president on January 23, has announced that humanitarian aid being stockpiled abroad will begin entering the country on February 23. 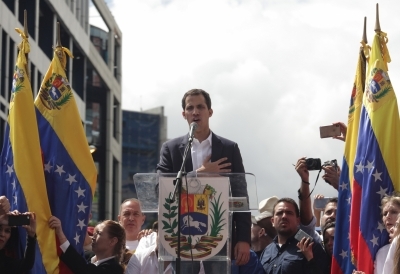 "We're announcing that February 23 will be the day for the entry of the humanitarian aid, and so from today we will work with all sectors -- transportation workers, nurses who must introduce and distribute the aid," said Guaido on Tuesday at the close of a rally here. The US, which rushed to recognize Guaido's claim to the presidency, is organizing the aid effort that Nicolas Maduro, the elected head of state, has denounces as a prelude to military intervention by Washington. The 35-year-old opposition leader said that next weekend assemblies will be held and "humanitarian camps" will be established with an eye toward organising and preparing everyone who has volunteered to help distribute the aid to go to the country's border with Colombia if the military does not allow the aid to be brought in. "We have to go in caravans, in protests, in mobilisations," Efe news quoted Guaido as saying. "You (government supporters) talk about an alleged war that will not exist," he said. "Who would be ready to go to war if (Maduro) has neither the support or the respect of his neighbours and the world?" he said.